The Kokura plant, where the RX is built, has installed a 3 meter-high mesh “waterfall” that has reduced airborne dust by 90%. The chain conveyor belt has been replaced by urethane rollers to reduce noise in the factory, helping the works to concentrate on their duties. Every RX 450h is tested for leaks in a giant shower booth, which is capable of rainfall stronger than a typhoon. Each RX 450h is built from 300 stamped parts, welded together at 5,000 different points. Although I usually avoid reprinting press releases, this really is an interesting document, click through to read the entire thing. 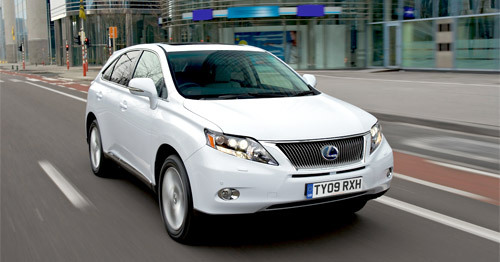 The supreme quality that defines the new Lexus RX 450h begins with the factory where it is built. The design, equipment, manufacturing procedures and the skills of master craftsmen working at the Kokura plant are all fine-tuned to achieve the best possible results on every car that comes off the production line. The attention to detail is distinctively Lexus, ranging from strict environmental controls to staff being required to wear pocketless, anti-static clothing. “Clean and Silent” initiatives contribute to a quieter assembly line which helps workers concentrate, improves efficiency and helps cut down the number of faults. Much of the manufacturing process is carried out by programmed robots, ensuring consistency, but the hand and eye skills of the takumi – the skilled master craftsmen – remain a crucial element in achieving Lexus quality standards. A dust particle measuring just 20 microns – about the size of a grain of pollen – can have an adverse affect on the quality of body panel stamping, leaving scratches that are difficult to rectify later in the production process. Lexus has waged war on dust, subjecting its stamping dies to rigorous sanding and washing twice a week. As this process itself creates a lot of dust, the maintenance area is surrounded by a three-metre high net screen – nicknamed Niagara – across which there is a constant flow of water. Thanks to Niagara, the level of airborne particles in the stamping shop has been cut by more than 90 per cent. A rigid body shell plays a major part in the quality of the RX 450h’s driving performance, ride comfort and quietness. In turn, this high rigidity is achieved by using advanced, high-precision welding technologies. The bodyshell is made by the spot welding of around 300 stamped parts at up to 5,000 different points, work done by robots that move in and around the vehicle body as it is held on a jig. Lexus has developed a new slim robot that can work between the units, enabling many more welds to be made. For example, in the floor and side panel tack welding process, 14 robots were previously able to make spot welds at 70 to 80 different points; adding slim robots into the task has more than doubled this number. Gaps between the body panels and panel alignment are measured on the production line with precision digital callipers. The measurements are displayed on a monitor alongside the line and the vehicle body cannot proceed to the next stage until all the measurements are within the required parameters. Lexus has invested in lengthy research in order to achieve the superb surface quality from its multi-coating paint process. Cleanliness is vital to achieving this quality and, once again, extensive measures are in place to keep the painting process free from dust and other airborne particles. Conventional methods focused on preventing contamination at the paint shop’s entry and exit points, but Lexus has introduced a system like those used in semi-conductor factories, installing a number of small, one-way air outlets that pressurise the area prior to the topcoat paint booth, so forcing air away from it. This has brought about a significant reduction in the amount of airborne particles getting into the booth. To maintain an outstanding surface quality throughout the finishing process, the production line uses both the latest robotised technology and traditional hand polishing. All vertical surfaces are water polished with a plane sander after the intermediate coat is applied, then checked both by eye and with digital tools. Kokura is the world’s only dedicated hybrid manufacturing facility, designed to provide the perfect environment for making hybrid components. Again, preventing contamination from airborne particles is of paramount importance and to help achieve this, the assembly line has a low ceiling and a positive air pressure system. Air is constantly being forced outside the building, which helps prevent dust and other matter from entering. Inside, air pressure is modulated between different areas to create a flow of air that moves in the opposite direction to the manufacturing sequence. Components move downstream on shuttered conveyor routes; the further along they move, the higher the air pressure rises, with maximum pressure reached in the assembly process itself. Temperature and humidity are rigorously monitored to maintain the stability of the factory environment all year round. Double measures are in place at the shipping exit to prevent any foreign matter entering, with a completely enclosed loading dock from where a conveyor moves parts to the receiving door via an airlock. The attention to detail extends to workers being required to wear pocketless, anti-static clothing and to wash their shoes. They are also prohibited from bringing any metal items with them into the production areas. “Clean and Silent” are the watchwords for the Lexus assembly line. Replacing the chain-driven conveyor with one that uses urethane rollers creates a quieter working environment, making it easier for the technicians to concentrate and hear the noise their tools are making, thereby improving precision and work efficiency. As well as being quieter, the new system also uses less energy and is easier to maintain. Air tools that are typically used for engine and underbody mounting have been replaced with electric nut runners that automatically adjust to a preset torque for a consistently high level of precision. The electric tools are also quieter and vibrate less. The RX 450h assembly process involves fitting several thousand parts to the bodyshell. Traditionally technicians would collect components for fitting from racks alongside the line, but by adopting the Set Part System (SPS), Lexus has eliminated the risk of problems caused by picking the wrong parts and has cut down the amount of walking the technician has to do, so increasing work efficiency. With SPS all parts required for assembly move along the line with the vehicle. This has evolved further with the RX 450h with a new gondola system for door assembly parts. A technician fills the gondola with the required parts on a sub line, which then merges with the main assembly line to travel along with the door to which the parts will be fitted. Cutting-edge measuring technology is combined with the human skills of the takumi craftsmen in the detailed inspection process. Automated in-line measurements and quality gate checks are made throughout the body welding and assembly process, with a final fitting inspection in which panel gaps and alignment are checked by hand and eye. The inspectors who do this have daily training and testing to maintain their skill levels. For example, the door closing speed inspection involves all doors being closed by the inspector at a maximum, laser-monitored 1.2m per second – equivalent to a gentle push with the fingertips. Lexus build precision ensures the doors can be closed securely, even with such light pressure. After comprehensive road testing, every RX 450h is transferred to a shower test booth to be checked for leaks. The booth simulates a rainstorm at a rate of 200mm per hour, which is more severe than even a typhoon, which will generate no more than 150mm of rainfall an hour.